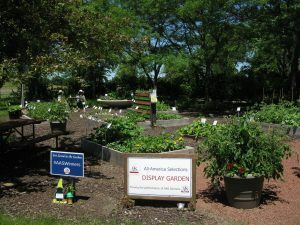 The grounds at the Kenosha County Center on Hwy 45 and 50 in Bristol are the site of an All America Selections Display Garden. AAS winning flowers and vegetables are planted and tended by Master Gardener Volunteers in the University of Wisconsin-Extension Master Gardener Program. AAS (All-America Selections), a non-profit organization, tests new flower and vegetable varieties and then promotes the best performers as AAS Winners. After AAS judges determine the AAS Winners, these plants are grown in AAS Display Gardens to provide local gardeners an opportunity to view them growing in a garden setting. 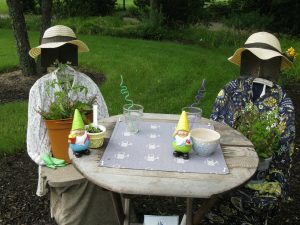 “Get Social in the Garden” is the garden theme for 2018. There’s nothing better than ice cream to share with friends & family at summer gatherings. Visit the KCC ice cream garden this summer and create your own ice cream social! In January 2014, the Kenosha County Center Demonstration Garden was selected as an AAS Display Garden. Kenosha County is the eighth display garden site in the state and is garden on municipal property in Wisconsin. 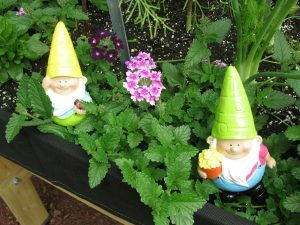 Sven & Glen socialize with garden visitors who are displaying AAS winners growing in ice cream themed containers. Due to the clay soils that dominate Kenosha County, raised beds filled with a topsoil/compost blend are utilized in order to plant the seeds/cuttings sent by AAS to be grown at the site. Several different types of raised beds are displayed. The 2015 theme for the AAS Landscape Design Contest was “Geometry in the Kitchen Garden”, and the garden was designed and planted according to geometric principles and patterns. The creativity and cleverness expressed in the garden was noted by the judges, and the Kenosha County Center Demonstration Garden was awarded Third Place in Category 1 in the 2015 AAS Landscape Design Contest! “Pollinator Education” was the 2016 theme, and the KCC Garden won 2nd place in Category 1! In 2017, with “Foodscaping” as the theme, this garden was awarded third place in Category 1! “Getting Social in the Garden” was the theme for 2018, and the Kenosha County Center AAS Display Garden took 2nd place in Category 1! In the 5 years of this garden’s existence, each year this garden has won a national award! For information, contact 857-1945, the Kenosha County UW-Extension office.